This poem was sent in by one of our readers name Jacquelyn K Heasley. She wrote it when preparing to teach her preschoolers about the Sheep and the Shepherd. We hope you enjoy and find it useful in your ministry too. A nice one slim and tall. He loved them one and all. Spending time grazing the hills. And followed as He willed. Stronger and lovelier every day. With their Shepherd right away. Never once was He mean. This nice shepherd as He led. Trusting Him as they were fed. Written by Jacquelyn K Heasley. Click here to download this poem in a print-friendly PDF file. 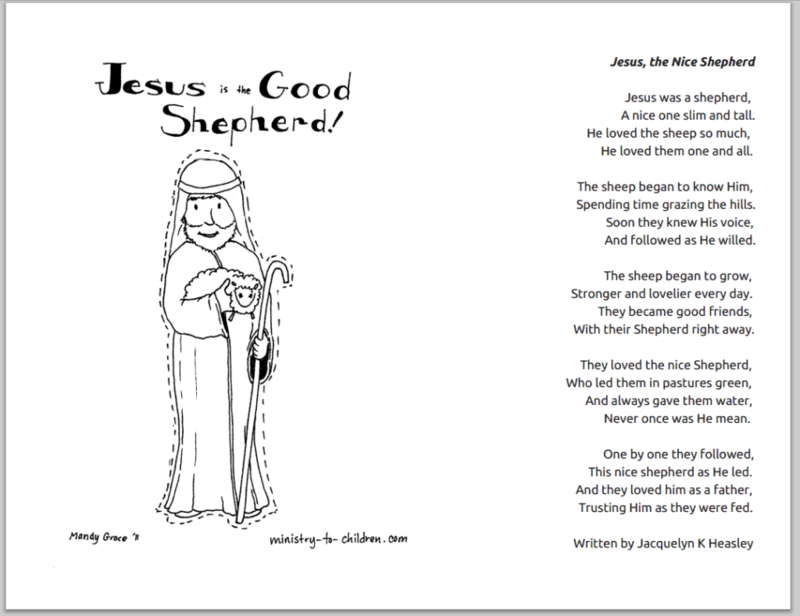 The illustration used above is also available in a full sized Good Shepherd coloring page. If you enjoyed this Bible lesson poem, be sure to leave a note saying thanks to the author. You might also want to check out her blog.